I read this article and found it very interesting, thought it might be something for you. The article is called From the Flames: Phoenix Rising Exhibition at Hugh Lane and is located at https://www.totallydublin.ie/arts-culture/arts-culture-features/flames-phoenix-rising-exhibition-hugh-lane/. On July 15, 1914, the doors of Dublin’s former Linen Hall on King’s Inn Street opened its doors to The Civic Exhibition, an exposition of town planning, an exploration of urban and rural life, and a study into industry and commerce. As well as exhibiting art, archaeological and historical artefacts, and running a town planning competition, it showcased local crafts and cultures: there were competitions in butter-churning and tea-dancing; lectures from eminent town planners and businessmen, including Selfridges founder Gordon Selfridge. A central component was the Civic Institute of Ireland’s competition to draw up a comprehensive new town plan for Dublin. An all-encompassing civic showcase posing Dublin as a ‘Phoenix of Cities’, rising from its political and social strife, it was declared by The Irish Times as ‘one of the most important enterprises in modern Irish history’. Chances are, you weren’t aware of it. 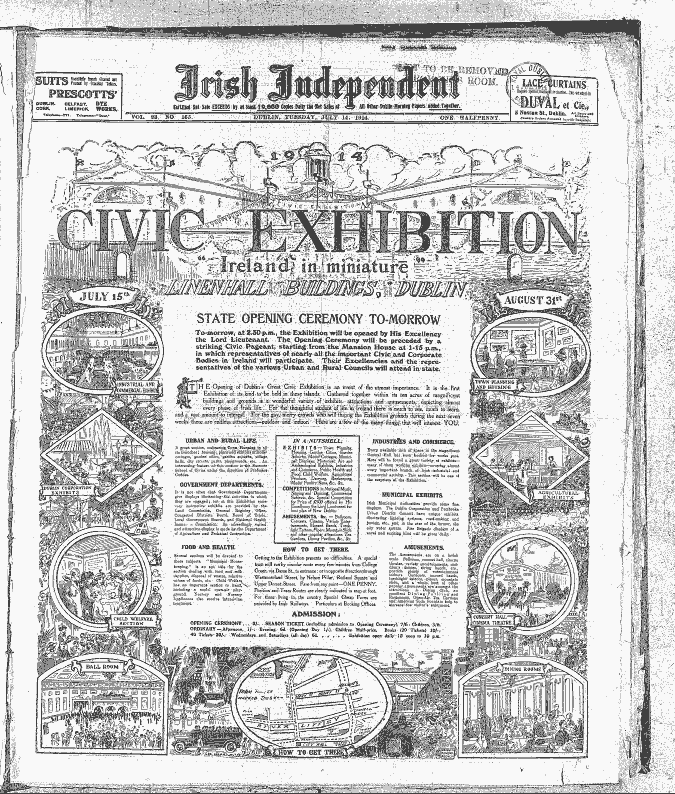 The 1914 Civic Exhibition has withered down to an obscure footnote in Irish history. In art historical textbooks its significance looses traction to William Dargan’s Great Industrial Exhibition of 1853, in which a great, glinting glass structure was erected in Merrion Square (modelled on the Crystal Palace, site to London’s 1851 exhibition), and the 1907 Irish International Exhibition, held in Herbert Park. In social and political history, too, it is overshadowed. Little over two weeks before opening, an Austrian Archduke named Franz Ferdinand was shot driving through Sarajevo; mid-way through the Civic Exhibition’s run, Europe was plunged into all-consuming war. The Civic Exhibition and its utopian visions of town planning would be rapidly swept away by the cataclysms of history. Had the exhibition achieved its aims, Dublin might have become a very different place. Its organiser, Patrick Geddes, proposed that the exhibition’s premises, The Linen Hall, become a hub of education and development; instead it briefly became a British barracks before reaching fiery destruction during the 1916 Rising. At the core of the Civic Exhibition’s values were town planning, with a view to providing sufficient housing for Dublin’s inner city poor, and – in contrast to similar showcases like the Great Industrial Exhibition – an emphasis on conservation and restoration, as opposed to building anew. However, the winning entry of the town planning competition – initially such an integral part of the exhibition – would not be announced until two years later, and even then it was not published until 1922. By the time it did appear in print, the visual cues supplementing the winning entry had morphed into something quite different in tone to the 1914 exhibition. 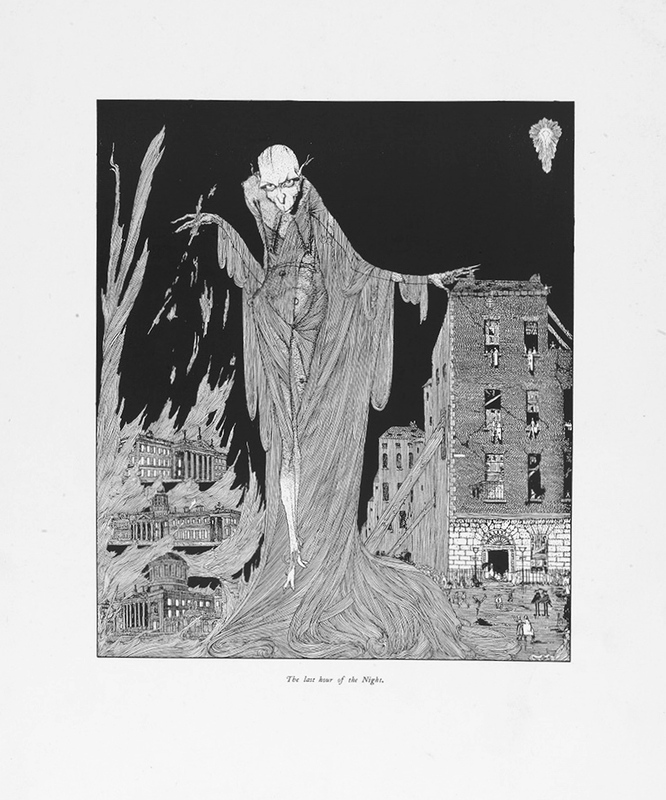 By Patrick Abercrombie (who would later contribute to the rebuilding of London following the Blitz), the plan was published under the title Dublin of the Future, and bore a demonic frontispiece from Harry Clarke. Whilst Geddes saw 1914 Dublin as ready to rise from the ashes, a civic underdog overcoming adversity to build homes for the urban poor and commerce to bolster its economy, Clarke’s illustration for Abercrombie’s Dublin of the Future shows a Dublin still very much burning. Elongated flames lick up from the windows of the GPO, Custom House and Four Courts; a sinewy ghoul paws at the roof of a Georgian townhouse as citizens panic in the streets. ‘The last hour of the Night,’ reads the apocalyptic caption. Dublin’s embers were yet to stop smouldering; the Civic Exhibition’s utopian visions had clearly arrived a little premature. Optimistic though its plans may have been, the Civic Exhibition’s onus on town planning, social housing and rebuilding was by no means unwarranted. The 1914 Dublin Housing Enquiry (which Patrick Geddes provided evidence for) found that nearly 100,000 Dubliners – roughly a third of the urban population – lived in either tenements or small houses deemed unfit or scarcely fit for human habitation. Infant fatality rates were high; tuberculosis was rife; skilled workers were either unable to find work, or in receipt of pitiful salary. In September 1913, two four-storey tenement buildings on Church Street collapsed, killing seven people and leaving over 100 homeless. One of the fatalities, a 17-year-old boy named Eugene Salmon, was a Jacob’s factory worker, out of work due to the Lockout’s ongoing industrial disputes. He died trying to rescue a younger sibling from the toppling building. What’s disheartening about the muted legacy of Geddes’s social housing propositions and the 1914 enquiry, is that tragedies like the 1913 Church Street collapse continued to happen for decades afterwards. In 1963, a wave of tenements across Dublin collapsed within weeks of each other: one on Bolton Street killed two elderly residents; another, on Fenian Street, caused the death of two young girls, aged eight and nine. In a third, residents narrowly missed catastrophe: residents had been evicted in the surrounding panic just days before. One man witnessed the building collapse seconds after he returned to collect his possessions. The exhibition’s emphasis on conversation and restoration, rather than building anew, was also seemingly flouted. To give some context, at the same time these tenements were collapsing, discussions were underway about the ESB’s plans for a new building on Fitzwilliam Street. In 1964, sixteen 18th-century houses on the longest unbroken line of Georgian houses in Europe were demolished to make way for it (now, coincidentally, facing demolition again). As RHA president Sean Keating declared upon the announcement of the plans in 1962, ‘the next move will be to feed the books in the Library of Trinity College to the boilers of the Pigeon House’. So if the philosophies of the Civic Exhibition had gained little steam 50 years on, are we any better now? In a city where the skeleton of the Anglo-Irish bank looms desolately over the riverfront, and ghost estates pepper the commuter belt, it’s tempting to say no. But look towards some of the more progressive architectural plans coming into fruition and there are nods that attitudes are beginning to shift. Ryan W. Kennihan’s winning proposition for 16 Henrietta Street respects the site’s historic environs, erecting a brick facade that appears in sync with its 18th-century surroundings whilst subtly hinting at its more modern history through the use of blind brick windows. Across the city, on Merrion Square, the Goethe Institut’s proposed mews will utilise a clever combination of glass and copper to mimic its red-bricked environs, as well as incorporating brick itself into the structure. It’ll be linked to the current Georgian premises by a garden tunnel. 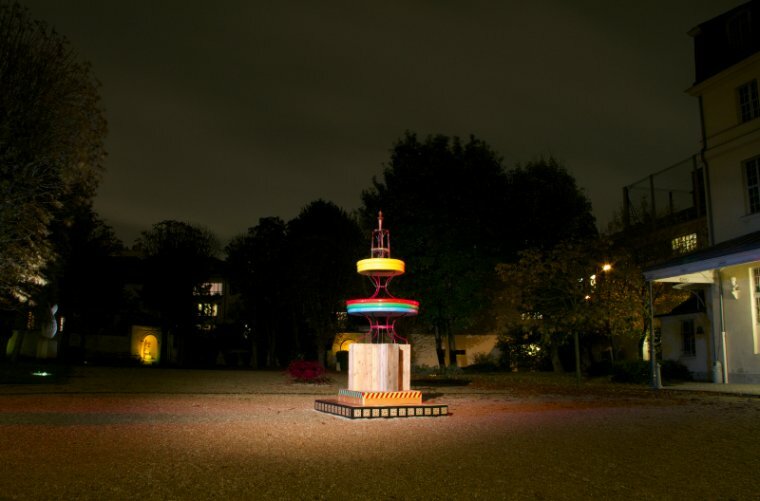 From Thursday 6th November to Thursday 26th March 2015, Phoenix Rising: Art and Civic Imagination will featuring newly commissioned work from six contemporary artists, playing loosely upon the themes raised by the original Civic Exhibition. Alongside this visual arts programme, curator Logan Sisley will present fresh original research on the exhibition and its legacy, publishing a news bulletin via the Hugh Lane website (www.hughlane.ie). More about the artists exhibiting at Phoenix Rising: Art and Civic Imagination.